After the Swedish GP the teams rushed south again - a trip of 1200 miles - in order to get to Paul Ricard (having done the trip in reverse before going from Monaco to Anderstorp). This meant that there was little time for any modifications. Ferrari was back up to two cars again (Arturo Merzario rejoining Jacky Ickx) while Andrea de Adamich also reappeared in his Ceramica Pagnossin Brabham. Reine Wisell was called in to replace Mike Beuttler who had suffered some minor injuries when his F2 March had gone under the barriers at Rouen the previous weekend. Peter Revson was away racing in the United States and so McLaren fielded Jody Scheckter once again. Hesketh was back in action with a March for James Hunt and the Ensign team made its first appearance with Rikki Von Opel. John Watson had been scheduled to make his F1 debut with a fourth Brabham (being run by Team MRD, which fielded De Adamich) but the Ulsterman was out of action with a broken leg. With Nanni Galli having retired from racing Williams took on its old hand Henri Pescarolo. Chris Amon was entered in the Tecno but the car failed to appear because of a dispute between the team and its sponsor Martini. Qualifying resulted in pole position for Jackie Stewart (Tyrrell) with the impressive Scheckter and Emerson Fittipaldi (Lotus) alongside on the front row. The second row featured Francois Cevert in the second Tyrrell and Ronnie Peterson's Lotus, while Denny Hulme (McLaren), Jean-Pierre Jarier (March) and Carlos Reutemann (Brabham) made up row three. The top 10 was completed by Clay Regazzoni's BRM and Merzario's Ferrari. Scheckter took the lead at the start with a fast-starting Peterson being chased by Stewart, Hulme and Fittipaldi. The five cars stayed together for the first 16 laps but then Hulme disappeared with a tire problem. Stewart stopped with a similar problem a few laps later. With Stewart seemingly out of the way, Peterson waved Fittipaldi through into second place to see if he could challenge Scheckter. On lap 42 Scheckter hesitated while lapping Beltoise and Fittipaldi saw a chance to get ahead. Scheckter refused to give way and the two cars collided. Both retired and so Peterson took the lead and went on to win his first Grand Prix victory. 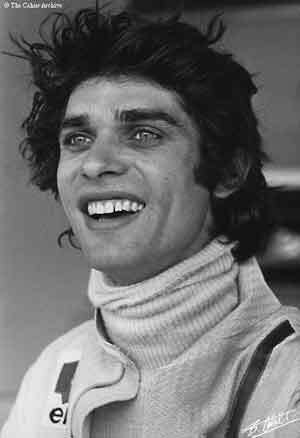 Cevert finished second with Reutemann third and Stewart recovered to take fourth. Hunt again impressed and finished sixth.